For past few years, WordPress community has come up with revolutionary developments in the form of WordPress plugins, schemes, and frameworks aimed at simplifying the processing of this remarkable platform. Gone are the days when WordPress theme development was long coding processes to create WordPress sites. But now using pro-built WordPress theme frameworks has become the trend of web designing. Conventionally, WordPress themes were developed by creating dynamic HTML codes right from scratch, which were then integrated using multiple theme functions to create desired web solutions. The process is not just complicated but sometimes get tedious and error-prone. Here at TemplateToaster WordPress theme builder comes the relevance of WordPress theme frameworks that come with inbuilt set of functions helping the developers in creating remarkable themes. In this article you will become aware of the popularly used WordPress theme frameworks, it is now important to know the reasons as to why to use WordPress Theme frameworks. Why to use WordPress Theme Framework? Here are the major reasons as to why WordPress theme frameworks are getting so popular in use. They quicken the process of dynamic WordPress theme development which ultimately saves time and lots of energy too. Offer plenty of customizable options that can be integrated to leverage the functionality of the site. Inbuilt multipurpose features like drag-and-drop option, revolution sliders, headers, widgets, SEO-friendly, etc. Neatly coded and validated markups are used during each project development. Timely updates and bug fixes are available securing an authorized and failsafe system. No necessary coding is required, which means even a newbie designer can easily work with them. Well-organized community support, that helps in resolving issues at any phase of development. But wait! Are you confused about which one to pick or not sure of the one that you have picked? No worries, here are tips you can consider before choosing the right WordPress theme framework for your site. How to pick the right WordPress Theme Framework for your project? Here are the tips you can consider while picking the framework for your next WordPress theme development project. Free or premium: Check if the given WordPress theme framework is available free to use or comes with a price tag. Once you estimate your budget, make sure you choose the theme framework that fits well in that budget. No more, nothing less! Size: Make sure you choose WordPress theme framework which is light and easy to install. Choosing a heavy and complex one would be of no help. It would not only make your system run out of space but would make it slow performing. Dashboard Control and system: Pick the one that you find comfortable to run and access with. No theme with inaccessible API’s or core coding can help in fruitful functioning. So go for the one that has a user-friendly interface. Flexible: Framework that confers flexibility to power multiple projects can undoubtedly turn out to be helpful in the future prospects. Such frameworks allow easy integration of added software and plugins to extend their functionality. Support: Do not go for the theme that is new and not backed by an expert community. As such frameworks are prone to virulent threats and malicious activities. 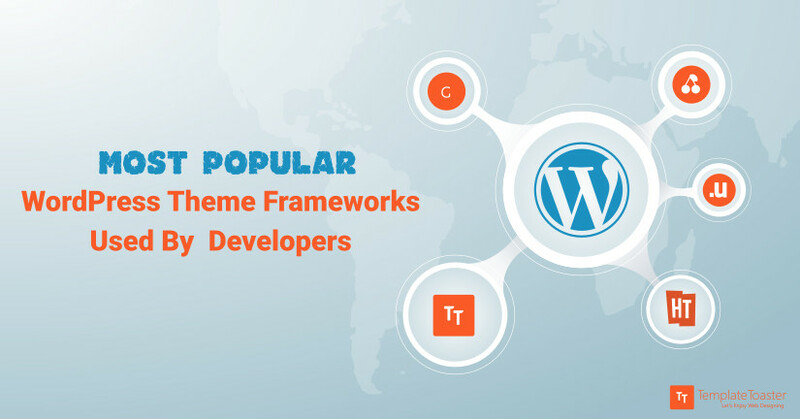 Here let’s take a look at some popularly used WordPress theme frameworks that have impressed web developers globally. This is a popular WordPress-powered popular theme framework. Genesis comprises exclusive features which can be used to create remarkable themes offering power and control at all levels. This WordPress theme framework is not expensive instead, it is highly advanced offering the latest features helpful in developing themes. TemplateToaster is a new-age theme framework that best suits the development requisites of theme developers. Owning to its dynamic features, this framework has clearly made it to the list of top WordPress theme frameworks. You can easily access this software to build custom themes for your site. Cherry Framework is another in the list that can be easily used by developers to create unique themes. Unlike Genesis, this framework is available for free to use. No wonder naive developers pick this framework for initiating the process of theme development as compared to buying a premium one. Another headstart fuel for naive designers who are either new or not like coding at all. Headway is a powerful theme framework constituting remarkable features that can be controlled and utilized during the process. Developers can save a lot of time when using this framework for their next development process. Ultimatum is one such theme framework that can actually help in creating remarkable customized themes ensuring greater visibility of the sites on the web. This is a powerful tool conferring manifold advanced functions helping you in creating customized theme layouts with no hassles. Designers, who love to create designs on a blank canvas, would find this theme builder a wise choice. It is a general purpose theme framework known for serving more than 42,000 websites worldwide. With its light structure and intuitive management, almost all newbies and experienced designers are shifting to using this framework for developing advanced themes. Thesis 2.0 offers a variety of functionalities and features to change the UX and UI of the theme. You can easily customize fonts, colors, sizes, etc. as per your need. iThemes is another popular WordPress theme builder that has been meticulously coded to frame powerful sites. Builder comprises a comprehensive set of elements like child themes, style manager plugin, and a core builder theme. The developer-friendly structure of this framework allows it to be easily utilized for creating dynamic themes. Last but not least, choose WordPress Theme frameworks that best suits your business requisites and project requirements. And for all newbie site authors, getting professional help from a leading Web development company like CSSChopper would be a wise decision. If you think the list can be extended with few more names of WordPress theme frameworks, feel free to share your opinions and suggestions in the comment box below. David Meyer is a senior web developer working with CSSChopper for last 8 years. He loves to write blogs on topics that concern IT industry and in his spare time, he loves to cook new cuisines.